During senior wellness exams: Cat blood tests are usually recommended for cats as part of their periodic senior wellness exams. These are extremely beneficial, as we often see senior cats return to a more youthful state of being when blood tests identify an issue that can be easily treated. At Metairie Small Animal Hospital, blood tests for cats can be processed and analyzed on premises at our in-house laboratory. Having an on-site laboratory allows us to quickly and reliably determine and diagnose a health concern, and then implement a successful medical intervention based on the results. We also maintain relationships with outside laboratories which are used when results are not needed immediately or when ordering more complicated tests. 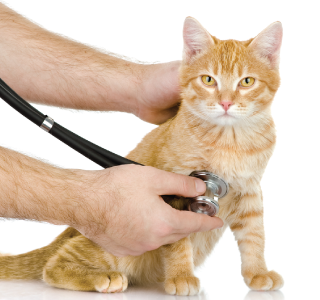 The results of feline blood tests are essential to helping veterinarians diagnose and treat medical conditions both within the blood itself, as well as in organs such as the kidney and liver. During a blood test for cats, various chemicals in the blood stream are analyzed. Alkaline phosphatase (ALKP): Elevations in this test may indicate liver damage or active bone growth in a young cat. This test is especially significant in cats. Cholesterol (CHOL): This test is used to supplement diagnosis of liver disease and diabetes mellitus. Chloride (Cl): Chloride is an electrolyte that is typically lost with symptoms like vomiting or illnesses such as Addison's disease. Elevations often indicate dehydration. Coristol (CORT): Cortisol is a hormone that is measured in tests for Cushing's disease (the low-dose dexamethasone suppression test) and Addison's disease (ACTH stimulation test). Potassium (K): This is an electrolyte typically lost with symptoms such as vomiting, diarrhea or excessive urination. Increased levels may indicate kidney failure, Addison's disease, dehydration or urethral obstruction. High levels can lead to cardiac arrest. Sodium (Na): Sodium is an electrolyte often lost with signs vomiting, diarrhea, kidney disease and Addison's disease. This test helps indicate hydration status. Cat bloodwork is an essential component in the diagnosis of disease. Just like any diagnostic tool, blood tests for cats are more effective when used as part of a diagnostic plan which may include other tests. For example, elevated BUN and creatinine levels can indicate a kidney problem. However, they can also indicate mild dehydration in the period leading up to the bloodwork. This is why ordering additional testing, such as a urinalysis, may be necessary to obtain an accurate diagnosis.